Not much news today but the quality made up for the quantity. The Great White Egret was seen again at Harwood Dale Lake but only early in the morning as later searches proved fruitless. 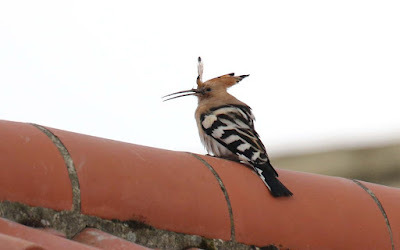 Chris McNaghten is definitely on a roll as following on from his Great White Egret yesterday he discovered a Hoopoe today in the grounds of the Raven Hall Hotel in Ravenscar at 16.55 on the large grassy area south of the Tennis Court. Unfortunately it isn’t exclusive to this area and did go missing a couple of times during the evening. This is the second record for Scarborough this spring following on from the one at Long Nab on the 11th-12th of this month. The best movement at Long Nab today involved 33 Sandwich Terns and 199 Swallows all heading south between 07.30 and 16.05. There was a Bar-tailed Godwit in Jackson’s Bay and Grasshopper Warbler activity was noted again in both Stile Scrub and at Cromer Point, they may be breeding at both locations. The highlights at Wykeham South Lake today were few but included 4 Egyptian Geese, c30 Swifts and a single Grey Partridge. Finally some late news came in concerning the first record for the year of Nightjars performing this evening in Broxa Forest.